I’ll take the Bentley please! – HubNut – celebrating the average! I’ll take the Bentley please! If there’s one luxury car I would seriously like to own, it’s a Bentley of the 1980s/1990s vintage. Take this marvellous example for instance. It’s a 1998 Bentley Brooklands R Mulliner. It uses Rolls-Royce’s famous 6.75-litre V8, with a low-pressure turbo helping it produce an utterly effortless 300 or so bhp. 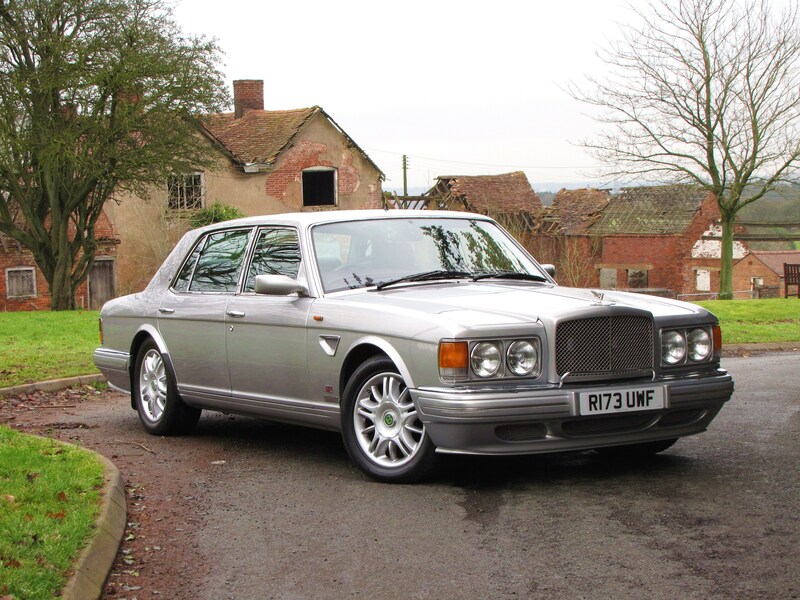 Sure, the blingy styling isn’t entirely comfortable – I prefer earlier incarnations of these Silver Spirit-based Bentleys – but there’s no denying it has presence, even in subdued silver. Firstly, I must concede that the Rolls Royce Silver Spirit, on which his car is heavily based, is not my cup of tea at all. I find the grille too ostentatious and the handling far too wobbly, even for a 2CV owner. Bentley’s revival began with these cars though. At first, all you got was a different grille and, er, that was about it. 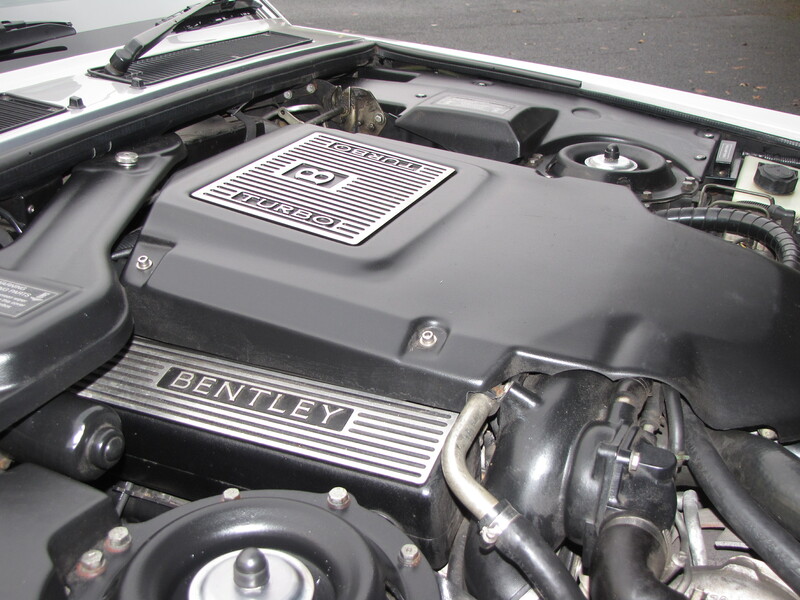 Then someone had the bright idea of bolting a turbo on to create a Blower Bentley, just like the good old days. The Mulsanne Turbo still had wobbly suspension, but the much-tweaked Turbo R sorted all that out. By the time the one above was built, there was a baffling array of Bentleys, all with the same body but many variations of engine, up to the fearsome 400bhp Turbo RT. You don’t need that much power though. Give the pedal a good length and the R Mulliner leaps towards the horizon with a most unseemly amount of haste. What boggles the mind is that it does so with seemingly no strain. It isn’t raucous, just insatiably brisk – 60mph coming up in a smidge over eight seconds. Mind you, your comprehension takes a further pummeling when it comes to corners. Despite being smooth enough to unruffle your passengers, the car handles with a degree of agility you just don’t expect of something weighing over 2400kg. Sure, the rather necessary power steering can’t provide race car feel, but the Bentley dashes into an apex with balletic grace, and body roll is notably minimal. The surge of power though is addictive. I found myself slowing down just so I could speed up again. All this happens amongst the finest in luxury. There aren’t just carpets, but immaculate over-rugs that make you want to remove your shoes before clambering aboard. There is immaculate woodwork and beautiful leather – albeit with curious coloured piping in this case. The Mulliner allowed a great deal of customisation. The switchgear is a bit odd though. Some feels beautifully constructed. Other bits feel surprisingly cheap. Overall, it just doesn’t feel as special as earlier models, with their column gear levers and feel-the-quality switches. I must admit that an airbag is all well and good, but this was an era before designers had really worked out how to make a steering wheel so equipped look even slightly pleasant. The wheel wouldn’t look out of place in a Mondeo. Where you really feel the quality is in the doors. They’re very hefty, and the hinges suitably beefy. Yet they swing majestically and close with a noise that suggests heft and quality. Then there’s one of my favourite touches – the pantograph driver’s wiper. Whenever I climb behind the wheel of one of these cars, the wipers will soon be operated. I apologise for my geekiness. Under the bonnet – don’t bother. There’s very little to see. Even premium cars it seems are subjected to their engines being shrouded in plastic secrecy. “Oh yes, it’s one of the finest engines of all time. No, you can’t look at it. No, not even if it is your car.” I know very few Bentley owners would even know where the nicely engineered bonnet catch is, but I do feel enthusiasts deserve a better view! What is perhaps most shocking is how cheap these big Bentleys are getting. If you’re feeling brave, you can pick up a turbocharged Bentley for as little as £5000. Yes, it will almost certainly cost a fortune to run and restore, but given how many people are happy to spend £20,000 or more on a Ford Focus, the Bentley seems like superb value! Sure, it’ll probably do 13mpg at best, but from behind the wheel, you’ll consider it money well spent, believe me. I really do think I’m going to have to save my pennies and see just how badly wrong a cheap Bentley can be. This may take some time, that’s true, but the local(ish) petrol station will be thrilled! There’s one of these for sale in the garage opposite my house for £12,999. Shall I ask for a 90% discount? If it’s an R Mulliner rather than the ‘basic’ Brooklands, it’s good value!